In ayurveda just as there is art of eating, there is the art of drinking water in form of indispensable guidelines for something we always have overlooked. Very often we hear the advice to drink more water. We read everywhere the benefits of drinking at least eight glasses of water per day for losing weight, for boosting energy, for glowing skin, shining hair, in fewer headaches and many more. When we try to approach to this healthy lifestyle by increasing our water intake with the goal of improving health, we try to manage it best by keeping a water bottle or a jug of water nearby or we try to use an app to track how many glasses we should finish and sometimes, we even set up reminders in our phone. But after a month or so, our habit of drinking more water ends. The taste of plain water doesn't excite us anymore. Moreover the busy schedule keeps us disturbing about a lingering feeling of thirst as the frequent bathroom visits are a bit annoying and ultimately the stress overwhelms by not experiencing all that fantastic benefits of drinking water and ultimately we start doubting that we have not given enough time or maybe we are making a few mistakes in our attempts to stay hydrated. A person can go for weeks without food, but only a few days without water. It plays a vital role in majority of body functions. According to Ayurveda, to achieve proper health benefits of water, there are some principles for drinking water properly. According to Ayurveda, cold water extinguishes the heat of the “digestive fire” and promotes the buildup of toxins in our immune system that develop as a by-product of poor digestion. Sipping warm water, improves digestion by stimulating the natural digestive enzymes and improving circulation. Warm water is always considered to be the nature's most powerful home remedy that can help to alleviate body pains. It is very well known to provide instant relief from cramps and muscle spasms. The consumption of warm water increases the tightening of intestines and helps easy bowel evacuation. It can also help kidneys to function better. Moreover, use of warm water can help to clean toxins from skin and helps to repair skin cells which can lead to increase in elasticity of skin and thus can prevent premature ageing. There is a huge difference between how our elders drink water and how the following generation of our parents drink water. Our elders used to advise to sit down and sip water instead of drinking it all at once. In fact, we have never seen our elders chugging water while standing straight upright. How we drink can make a difference in how optimally hydrate our body. Drinking water at once causes greater volume of fluid in stomach that stimulates the activity of stretch receptors in the stomach, which then increases intragastric pressure and promotes it to flush through our system faster and can absurdly lead to dehydration. The inside of our body is a delicate, well-controlled environment. It has been found that kidneys filter it best and is retained in body, when we sip while sitting. Water intake while standing passes it with a push without much filtration. It causes impurities to gather in blood leading to the damage of kidneys. It even does not quenches thirst. Moreover while pouring water in mouth, it may go to breathing passage due to incoordination of hand and mouth. It has long been known that drinking water is first thing done in the morning and it purifies the body's internal system. This practice is known as “early morning water treatment”. Drinking at least 500 millilitres of warm water on an empty stomach rehydrates the body after eight hours of sleep. This helps our metabolism to flush out the toxins of our body packed up over night. The main reason for drinking so much water at once is to clean the colon and enable our body to absorb new nutrients from food. Famous ayurvedic practice of usha paan, that is, drinking the water early morning which has been kept in copper pot for 12 hours. Water stored in this way is called as “TAMRA JAL” Reason of adapting a copper pot is that it creates a natural purification process. It can kill all the microorganisms present in water that can be harmful to the body. Copper is considered as an essential trace mineral that thyroid gland needs to function optimally. Copper has a potent anti inflammatory properties, needed to relieve pains due to inflammed joints, speeds up wound healing. It also stimulates the brain function. Copper fights off the free radicals and thus slows down the ageing process. Apart from the fact that copper helps cleanse and detox the stomach, it regulates working of liver and kidneys. It also aids in proper elimination of waste and ensures the absorption of nutrients from food and helps to get rid of many diseases such as piles, constipation, headaches, blood pressure, anemia, obesity, etc. Only sip a small amount of water with meals. If we drink too much water while eating, our belly will not have enough room for water absorption. Drinking while eating is a common practice which should be avoided. Specially, beverages with meals should never be used. Our saliva is the first step of digestion. When we take time to chew the food thoroughly, our saliva that contains enzymes, helps to break down food and stimulate the stomach to release digestive enzymes. When we drink water with meals, saliva and digestive enzymes get diluted and digestion becomes difficult. Ayurveda strictly prohibits drinking water, especially at the end of meal which if taken, kills the energy required by our digestive system to process the ingested food. This allows food to remain in digestive system for longer duration which may cause the formation of gas and acidity problems. Remember the rule of ayurveda, fill stomach 50% with food, 25% with water, and leave 25% for digestive juices. The best practice is to avoid water 30 minutes before your meal and a minimum of one hour after meals. The body is about 60% water and we are constantly losing water from our body primarily via sweat and urine. However, health experts commonly recommend about 8 to 10 glasses of water per day or amount of water to half of our body weight in ounces is recommended always because if we don't stay hydrated throughout the day, a lot of biological processes will start to suffer. Everyone does not have a taste for plain water. But, to continue functioning of body properly, the amount of water that actually hydrates the body cells, is really important. So, rather than drinking copious amount of water, we can reduce our water intake and still stay hydrated by adding a pinch of mineralized salt to every glass of water. Salt contains minerals and elements and plenty of electrolytes which effectively regulate the water content within our body. Lemon and orange can also be added to overcome the boring taste of plain water. Cucumber is another water rich fruit that can be added to plain water to enhance its taste. Water melon, another popular thirst quencher, can be a refreshing factor to raise the taste to plain water. Use of clay pots is not just a traditional alternative to steel, glass and plastic containers but it is a healthy alternative as well. In ancient times, we used to drink water stored in matkas. Scientists claim that water in a clay pot is the best way not only to cool down the water but it also provides the healing elements of earth. Clay pot has pores visible at microscopic levels through which water seeps out and gets evaporated causing cooling. Alkaline nature of the clay interacts with the acidity of water and provides proper pH balance. This water can help curb acidity and inturn provides relief from gastric pains. Usually water stored in plastic containers have harmful chemicals like BPA (Bisphenol A) that cling to the molecules of water and pose a health hazard. So, the water stored in clay pots tastes natural, pleasantly chilled and improves metabolism. Ayurveda has a simple principle-listen to body's subtle signals and drink whenever feel thirsty. When we listen to thirst cues and sip water throughout the day, we will be drinking the right amount of water. But, if we continuously develop a habit of ignoring our body signals, our body can become desensitized and we might “forget” to drink. As we all are of different sizes with varied diet and life styles, one set rule of eight glasses a day simply cannot apply to everyone. So, whenever we feel thirsty we should drink water. Ayurvedic rules are ancient, yet timeless. Some of its practices might seem simple but the benefits have been proven over centuries of use. As we start to form proper drinking habits, we will experience all those benefits. We should start the day with proper water treatment to keep ourselves hydrated and keep on watching for the signs of dehydration in our body system. As soon as any sign of dehydration is seen in the body, immediately increase water intake. Each of our human bodies are built up of billion of cells and majority of these cells live in water. They require water for metabolic activity, for a strong immunity and for cellular function. And the way we drink water is extremely important. • Increases energy and relieves fatigue. • Flushes out body toxins. • Maintains normal bowel functions. • Helps to treat kidney stones. • Helps to keep skin looking good. The consumption of warm water increases the tightening of intestines and helps easy bowel evacuation. Ayurveda strictly prohibits drinking water, especially at the end of meal which if taken, kills the energy required by our digestive system to process the ingested food. Scientists claim that water in a clay pot is the best way not only to cool down the water but it also provides the healing elements of earth. • Add flavor to your pitcher. • Drink a glass after every bathroom break. • Sip before every meal. • Keep a water jug nearby. • Invest in a filter. • Jazz the water with minerals. 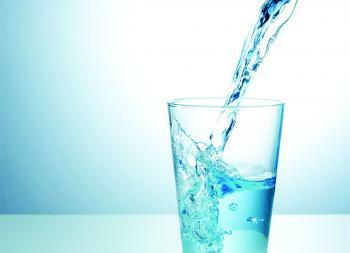 • Drink one glass of water 30 minutes before a meal to help digestion.